This seems like an obvious one, but all too often I hear of businesses being so focused on ironing out the details of what the live support service will look like, they forget to think about how they will get to that point. When onboarding a new support provider, ensure that each step is confirmed upfront. This requires a collaborative approach to working together to map out the processes and interactions that will take place after the service starts to ensure that everyone involves has a clear understanding of how it will work. Make sure you have an understanding of where the support transition and knowledge transfer meetings will occur (onsite or remotely), and what the key dates will be. The final action of this step is to wrap all of the agreed points into a clear transition and action plan with regular communication and update meetings scheduled. Sometimes businesses will find that the consultants they engage with during the transition aren’t the people who will actually be providing the support service. Having the same support consultants who performed transition providing support in the early months is beneficial to ensuring a smooth start. It avoids any risk of loss of knowledge between transition and starting the live service, ensuring SLA compliance from day one and an up to date documentation library accessible to the wider support teams. 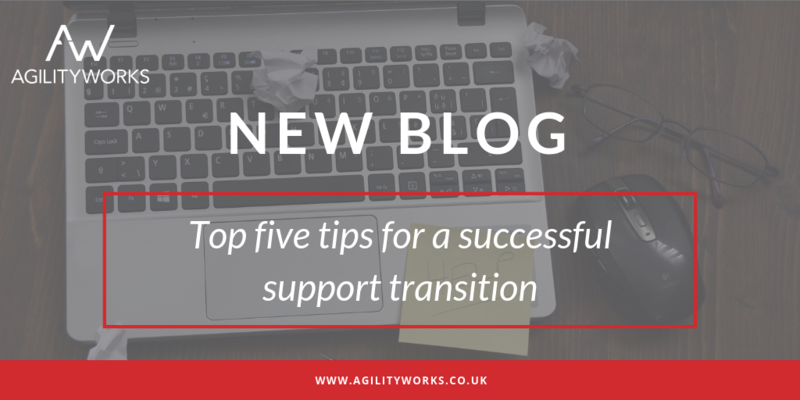 This tip might seem counterproductive – surely you need the current support provider to pass their knowledge onto the new provider? It’s true that you will need the existing provider to engage early on during the transition, but you should keep this limited. In my view the involvement of the incumbent support provider is not always conducive to success and can add an unbudgeted cost to the process. So we generally recommend that they be excluded from the process as much as possible on the basis that we can arrange face to face knowledge transfer meetings with key users or business process owners and any internal SAP support consultants, particularly technical resource. There’s a fine line between over documenting and under documenting, however the transition meeting outputs are an important stage for the internal support team training and ongoing reference. As well as this, it enables a demonstration to the client that a sound SAP and business process transition has taken place with a set of documentation that they too can access if needed. As a client, ensure that you get an understanding of the level of the documentation to be provided and that it will be made available you to validate within agreed timeframes. Service management is needed to help with managing the transition/onboarding process and is an essential aspect to the live support services. It’s important to ensure that you know exactly what that includes. The importance of a comprehensive service management transition can also not be underestimated; there’s so many touch points in terms of how a support service runs and is managed; these must be agreed in detail and documented upfront and updated as the needs of the service evolves.. The AgilityWorks Flex support transition approach provides a comprehensive and engaging onboarding process that follows our own methodology that has been developed through many years of support management experience, with proven success every time.